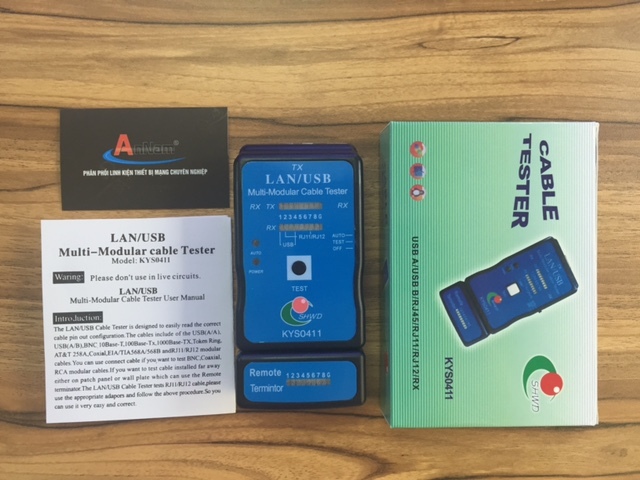 Multifunction Network Modular Cable Tester KYS0411Can test correspondingly double-twisted cables 1, 2, 3, 4, 5, 6, 7, 8 and G, meanwhile, KYS0411 Tester can judge wrong connection, short circuit and open circuit. Test of double-twisted cables: switch on the power. Put cables into both main tester and remote tester. The lights of the main Cable Testerwill turn on sequent form 1 to G.
Reading the result of LED display. Network Cable Testertells you read out the incorrect of LED display. The tested cable with the short, open, reversed, miswired and crossed. Cảm ơn quý khách hàng đã xem thông tin sản phẩm ! để đặt hàng liên hệ trực tiếp với số Hotline để được giá tốt nhất !